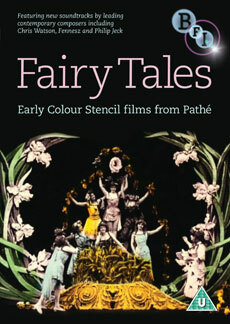 A selection of tinted fairy tales from the Pathé Frères company, made to appeal to young and old alike. Once upon a time, during the belle epoque in turn-of-the-century Paris, a short-lived film form called scenes de feeries, or fairy films, was becoming popular thanks to the Pathe Frerer company. In jewel-like colours the films, made to appeal to young and old alike, recreated the theatrical spectacles of the age with their fantastical settings, dancing girls, mythical beasts, supernatural beings and a plethora of stage tricks enhanced by the techniques of the new medium of film. Presented here with original hand-colouring, each film is accompanied with a newly commissioned soundtrack by recording artists from the leading experimental music label Touch. Contributions from such acclaimed composers as Chris Watson, B.J. Nilsen, Hildur Gudnadottir and Fennesz combine with the beautiful images to create a unique and unforgettable experience. Newly commissioned scores by Touch artists, including Philip Jeck, Fennesz and Chris Watson. Barbe-blue (1901, 11 minutes); Georges Melies' telling of the Bluebeard tale with music by SAVX. Little Red Riding Hood (1922, 8 minutes): Anson's Dyer animation made for Hepworth Picture Plays with music by Rosy Parlane. La Danse du diable (Sint-Lukas versions): nine alternative scores by students from Sint-Lukas Brussels University College of Art and Design. Fully illustrated booklet with film notes and credits. Barbe-blue (1901, 11 mins); Georges Melies' telling of the Bluebeard tale with music by SAVX.